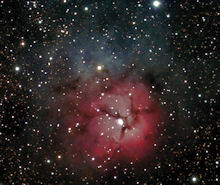 NEBULAE - Interstellar clouds of gas and dust. GALAXIES - Island universes of billions of stars. STARS and STAR CLUSTERS - Collections of stars. A double star can either be a pair of stars gravitationally bound to each other or may be an optical double (a pair of stars aligned closely through our line of sight but otherwise unrelated). Open Star Clusters range from groupings of several dozen to many thousands of stars. Globular Star Clusters are huge balls of 50,000 to 500,000 stars gravitationally bound to each other. 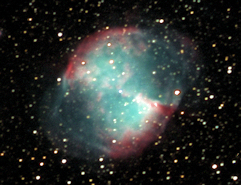 Be sure to visit AstroImages.org other astronomy sites! Aurora Images - Color images of the Aurora Borealis or northern Lights from Alaska and Maine. Includes a description of the cause of the lights. Astronomy Resources - Extensive list of astronomy resources on the internet, categorized by subject with descriptions of each site. Astronomy Books - Astronomy books that have helped me personally in my studies of astronomy, astrophotography, ccd imaging and image processing. All images copyright © 1997-2012 by Jeffrey A. MacQuarrie and may not be used without permission.